Our Parent Teacher & Friends Association is called "The Friends of West End" and raises lots of money for the school. Parents are automatically members and all are welcome to attend our informal meetings which take place each term. The minutes of our latest meeting can be found at the bottom of this page. Whenever you buy anything online you could be collecting free donations for The Friends of Ormskirk West End. 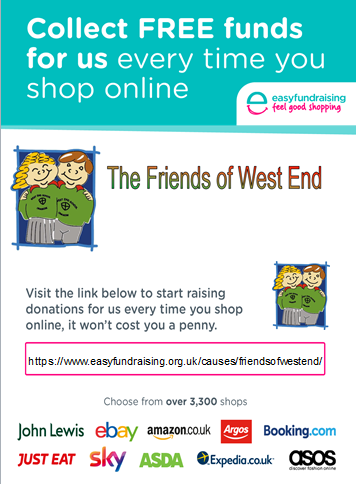 Every time you shop online please click above to access easyfundraising & then on to your usual shopping site. After you’ve checked out, the retailer will make a donation to our school, for no extra cost whatsoever! Our e-mail address is: friends@ormskirkwestend.lancs.sch.uk or you can leave a message at the school office.